Keep Tyler Beautiful has added another newly wrapped traffic signal box in their Beauty and the Box program. The City of Tyler and Keep Tyler Beautiful launched this pilot program in 2016 by wrapping ten traffic utility boxes in the Downtown area showcasing art designed by local artists. It has since added four additional boxes throughout Tyler. The newest box can be seen at the intersection of Broadway and Loop 323 and is being sponsored by Pyramid Homes. 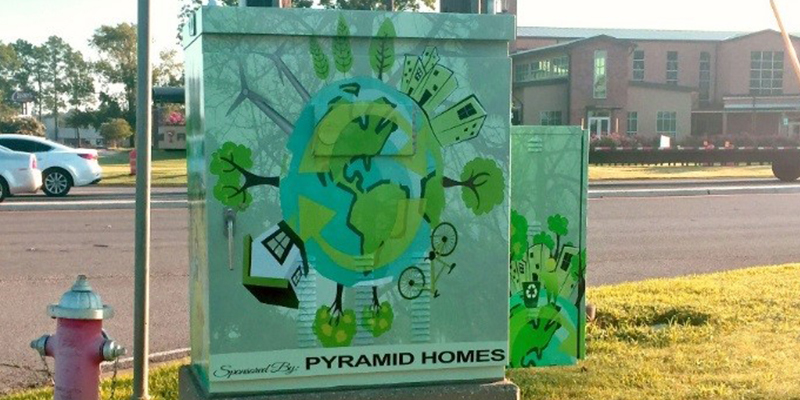 The artwork on the Pyramid Homes’ box features a green-living design, promoting recycling and clean energy. Anyone can sponsor a utility box in Tyler and sponsors will be able to choose from a selection of approved artwork at Main Street Gallery. They will also be able to place their name at the bottom of the box. For more information, please contact Leanne Robinette at (903) 531-1349, Angela Cardoza at (903) 343-6908 or email KTyB@tylertexas.com. More information can be found at www.KeepTylerBeautiful.com.